First, pour the sugar and the orange and lemon juice into the punch bowl, and stir until the sugar dissolves (just a few minutes). Add all liquors, maraschino juice, pineapple chunks and the orange and lemon wheels. 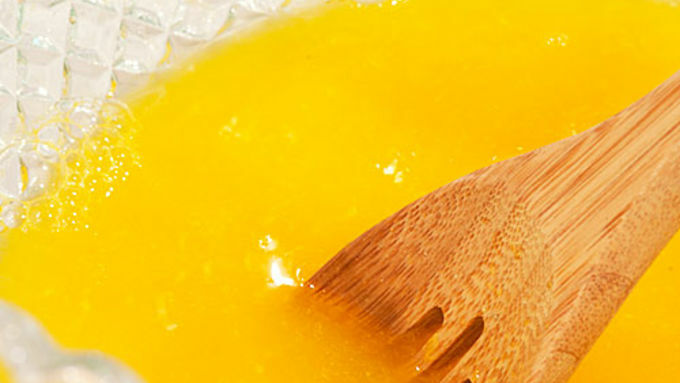 Cover and refrigerate for 2 hours, to let the flavors blend. Immediately before serving, add the chilled sparkling water and the frozen cherries. Stir and serve. Okay, don’t diss me for bringing up the holidays in, YES . . . September. I know, I know - we just got the kids back to school, and Halloween is around the corner, yada yada yada. 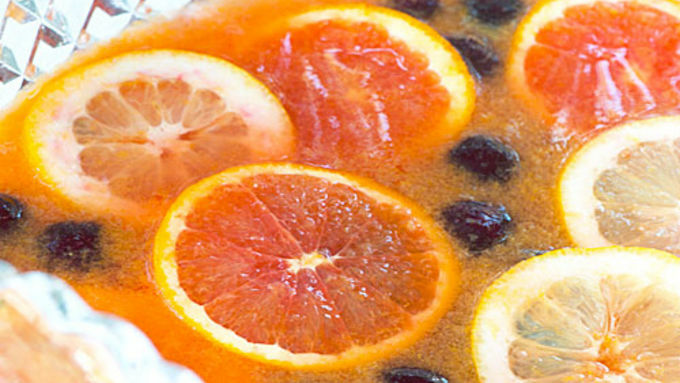 But a recent family celebration, complete with punchbowl, left me all mushy and misty and wanting to share this wonderful Holiday Punch recipe with you! For my family, punch is synonymous with celebrations, not just major holidays. 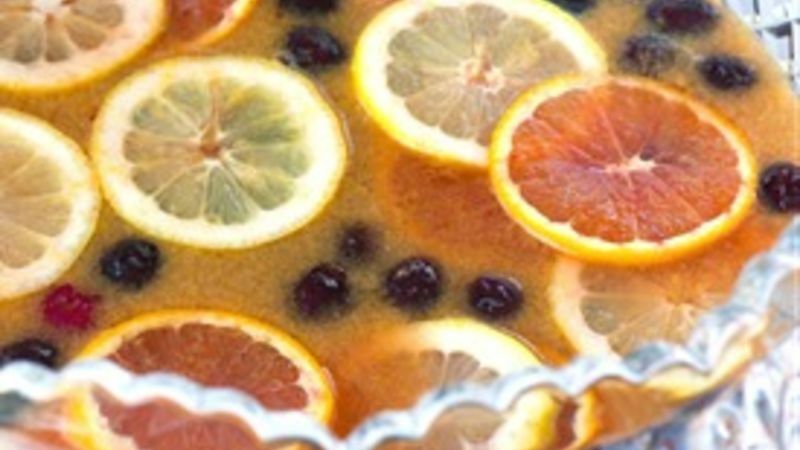 Nothing says “festive” like a punch bowl – who could argue that? I don’t have my own, so for any punch-requisite events, I borrow my cousin Max’s – which originally belonged to our Grandma Hilde. Grandma’s punchbowl is packed in its original water-stained box (my Grandparent’s house flooded at least a couple times when I was growing up.) It’s a HEAVY box – 21 pounds for the bowl, ladle, and 18 little punch cups. It’s a beautiful set –not Waterford or cut crystal, certainly, but heavy with lots of nice details - better than most you could get today. The set retailed for $35 when it was purchased (the price is right there on the side of the box! ), in the 50’s or 60’s. I’m guessing Grandma bought it on sale, too. Isn’t this a thoughtful message on the inside packing!? Just in case some took out the punchbowl and panicked – “sweet mercy, where are the punch cups”! Alright, enough of my memory lane. You want punch, and punch you shall have. The recipe is super easy – many of the ingredients you likely have on hand! Take note, punch making is a great time to clean out the liquor cabinet. The recipe calls for rum and triple sec, however I have made this punch with a variety of rums (light, dark, flavored, etc.) and fruit flavored schnapps or liqueurs with excellent results. (Once I even used cachaca, a sugar cane derived liquor, in place of the rum - this was completely off the hook in deliciousness . . . and potency.) But if you want to make this non-alcoholic, leave out the booze and add a little more cherry-flavored sparkling water. Cover the punch bowl with cellophane and put that bad boy in the fridge to chill for a couple hours, so the flavors blend. (Make sure you are chilling the seltzer water, too.) Add the cold seltzer and the frozen cherries immediately before serving. A word on the frozen cherries. I love using frozen fruit in punch – it eliminates the need for ice, and as such eliminates the yucky, diluted melt-y ice cube effect from the punch experience entirely. And what’s better than the punch soaked fruit at the bottom of your tiny cup? I rest my case! Pack a Punch! 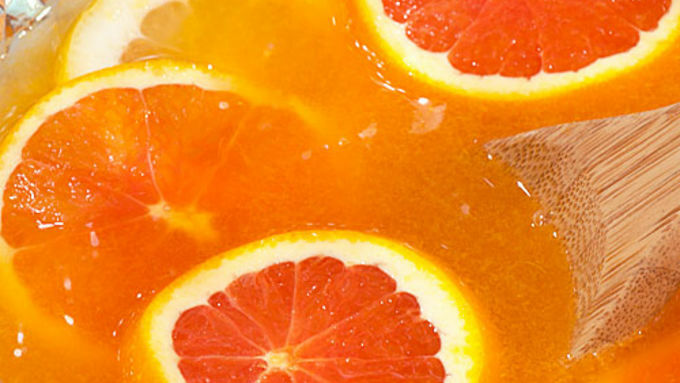 Here are more great punch recipes that are big on flavor.